The arrival of shrimp season in mid-summer is a joyous occasion for NC seafood lovers. Don’t waste a single shrimp shell this year – make shrimp stock! Shrimp stock adds a rich, complex flavor to any dish. Once you add shrimp stock to your next jambalaya, paella, pasta, grits, you’ll never turn back. Shrimp stock is a breeze to make. Start with some fresh NC shrimp, preferably head-on. 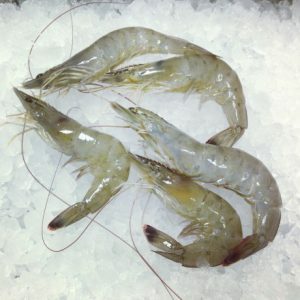 Enjoy the shrimp as you usually would, but when the time comes to discard the shells and heads, save them instead. You can save them in the fridge for a few days or toss them in the freezer. Next up, find a stock recipe that suits your preferences. It could feature tomatoes and lots of herbs or it could be incredibly simple. Sautee the shells in the stock pot with olive oil before adding water or the other ingredients. Once the shells turn opaque they are ready to go. This step coaxes even more of the shrimp flavor from the shells. Deglaze the pot with dry white wine before you add the next ingredients. This will help get the small bits of flavor from the pan. Skim as you go. While the stock simmers a little foam will rise to the top. Remove the foam with a slotted spoon. This will remove some of the fat and help the stock clarify. You can store your stock in the fridge for a few days, or in the freezer for 3 months. Use it in seafood soup, risotto, pasta dishes, gumbo, paella, grits, and more!